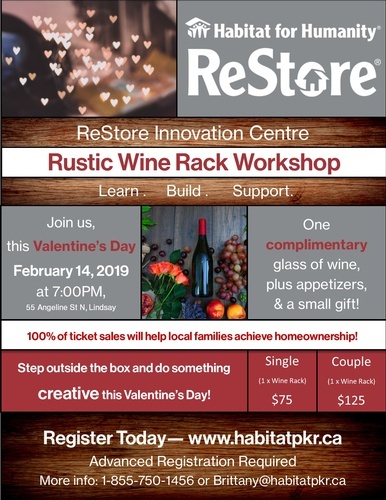 Join Habitat for Humanity Peterborough & Kawartha Region at their Lindsay ReStore location on Valentine's Day for a Rustic Wine Rack Workshop! Step outside the box and do something CREATIVE this Valentine's Day. Tickets are $75 (single) and $125 (Couple). Ticket price includes one complimentary glass of wine, plus appetizers and a small gift. For more info, reach out to Brittany at Brittany@habitatpkr.ca or call 1-855-750-1456. 100% of ticket sales will help local families achieve homeownership!